Bernie Sanders got pressed about specific policies on economic reform in an interview by the New York Daily News editorial board on April 1. 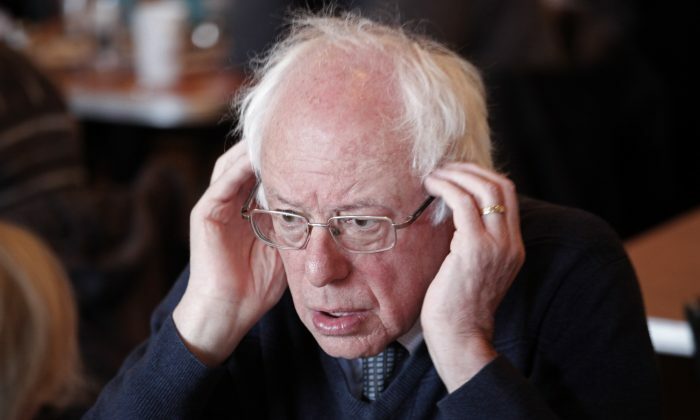 One of the major points of Sanders’s message is the unfairness of the banks, and in the interview Sanders stumbled over key questions pertaining to his core message about the break up of the banks. Daily News staff asked Sanders if he thought Apple, Inc., is destroying the fabric of America. Later in the interview, the Vermont senator stumbled over a question concerning the way he would go about indicting responsible people on Wall Street, which is a centerpiece to his campaign. Sanders: I believe that that is the case. Do I have them in front of me, now, legal statutes? No, I don’t. But if I would … yeah, that’s what I believe, yes. When a company pays a $5 billion fine for doing something that’s illegal, yeah, I think we can bring charges against the executives.